"The air by my cheek twanged twice, stinking of ozone, before I saw it." The Hobgoblin is a Vex unit specialized for sniping. Hobgoblins are hardened Vex units fitted with improved optics and acute sensors in their horns. They have distinctive tails  and are often armed with weapons called Line Rifles, terminals which theoretically draw energy from the accretion disks of galactic singularities. Nessus-born Hobgoblins maintain an orange glow that signifies a charged shield. Nessus-based Hobgoblins sport two tails. They are also more armored, sporting a second shoulder plate. When attacked, Hobgoblins often seal themselves in stasis within an impenetrable shield that renders them completely immune to all forms of damage. Guardians who step into this shield are inflicted with the "Burning" debuff until they withdraw. Occasionally, Hobgoblins make use of Slap Grenades to force players out of cover and push them back. These slap grenades do void damage, and the hobgoblin's line rifles do solar damage. In Destiny 2, they largely remain the same, save for sporting two tails, and a glow that signifies that their shields are charged. Their shields also restore a significant portion of their health. Two empty Hobgoblin chassis can be found inside the Tower alongside a collection of Cabal and Fallen weaponry. Shooting a Hobgoblin with a sidearm will prevent it from using its stasis ability. Hobgoblins in Destiny 1 have only one tail while the ones in Destiny 2 have two. 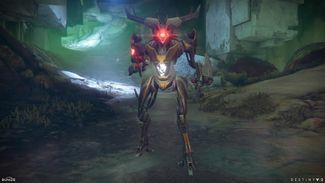 An in-game view of a Hobgoblin from Destiny 2.